For those of you keeping score, I’m still on jury service through next week. Hence, the paucity of posts. That’s all that’s going on. I’m perfectly fine. And it’s not that I don’t love you, honest. (Well, perhaps one or two of you. You know who you are.) So, please don’t worry. I’ll get back to a more regular update schedule once the trial is over. It’s no secret that I have a thing for Isis. Three thousand years later, a young science teacher dug up this lost treasure, and found she was heir to… the secrets of Isis! And so, unknown to even her closest friends, Rick Mason and Cindy Lee, she became a dual person: Andrea Thomas, teacher… and Isis — dedicated foe of evil, defender of the weak, champion of truth and justice! As highfalutin as all that sounds, the real attraction of The Secrets of Isis was its star, JoAnna Cameron, a charming actress who cut quite a fetching figure wearing Isis’s quasi-Egyptian miniskirt. Cameron, who appeared in tons of commercials and guest-starred on several TV series and in telefilms throughout the ’70s, never had another role as prominent as Isis. By the end of the decade, she had left show business and moved on to other careers. I’ve contributed in my own small way to keeping the legacy of Isis alive by commissioning several artworks featuring my favorite Saturday morning heroine. The drawing shown above, created by the talented and affable Gene Gonzales, is the most recent addition to my Isis gallery. Ironically, Isis came into existence only because Filmation, the studio that produced both Shazam! and The Secrets of Isis, refused to pay DC Comics for the licensing rights to Mary Marvel, Captain Marvel’s sister and the character originally planned for the distaff half of the Shazam! TV hour. Instead of shelling out the dough, Filmation created a new character based on the same general outline — a young woman who speaks a magical phrase (instead of “Shazam!” Andrea Thomas intoned, “O mighty Isis!”) and transforms into a superhero with powers derived from ancient mythology. DC ended up using Isis themselves, as the star of a short-lived comic series based on the TV show. 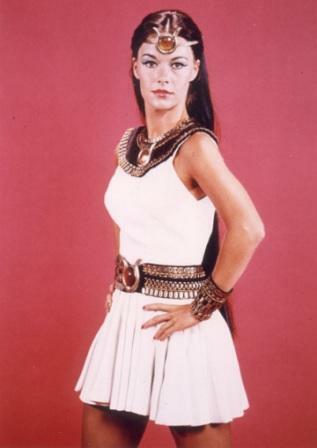 Isis, by the way, was the first female superhero to star in her own live-action program on American network television. All of the powered heroines who followed her to the small screen — from Wonder Woman and The Bionic Woman to Dark Angel and Witchblade — owe the Mighty Miniskirted One a debt of gratitude for kicking down the door. Aye, there be pirates here! Avast there, ye son of a bilge-rat! Ol’ Cap’n Swan ain’t here today. Out celebratin’ his favorite holiday, he be. Aye, that’s right, me bucko — it be International Talk Like a Pirate Day! So the good Cap’n says to raise a flagon o’ grog — preferably of the nonalcoholic variety, especially if ye be plannin’ to sail anytime today — and plant a smooch and a squeeze on the willing wench or sturdy swabbie (whatever be yer preference — Cap’n Swan don’t judge) o’ yer choosin’. And stay off the poopdeck, ye slitherin’ sea snake, or the Cap’n’ll hoist ye up the nearest yardarm! Categories: Aimless Riffing, Talk Like a Pirate Day, That's Cool! Not too long ago, my friend Damon asked me how close I am to completing my Bombshells! project — my ongoing series of commissioned drawings featuring heroines from the Golden Age of comics (defined for the purposes of this project as any character who made her debut prior to 1960) in pinups modeled after vintage bomber nose art. I told Damon that I’m nowhere close to the end. My Bombshells! to-do list still has another 64 heroines on it, and I probably haven’t unearthed all of the possible candidates as yet. Many of the names are obscure, but I still have a few that would be recognized by most knowledgeable comics buffs. They don’t come more recognizable than this. Supergirl devotee that I am, I was saving the Maid of Steel’s Bombshells! appearance for just the right artist. I don’t believe I could have made a better choice than Steve “The Dude” Rude, best known as the creator (with writer Mike Baron) of the long-running series Nexus. Rude’s retro style, influenced by such comic art legends as Jack Kirby and Alex Toth, suits Bombshells! wonderfully. His rendition of Supergirl could easily have appeared on a 1950s DC Comics cover. The tagline used here is my inside joke to other Supergirl fans. In her earlier days, Supergirl was noteworthy for her menagerie of super-pets, including Streaky the Super-Cat and a flying Super-Horse named Comet. Rude took my idea and ran with it, depicting Kara Zor-El astride her missile just as she used to ride her beloved Comet. I never quite understood why Supergirl would enjoy riding a flying horse when she’s perfectly capable of flying under her own power. But hey — that’s comics for you. That’s also your Comic Art Friday. My tenure as a juror began today. Which makes this the perfect opportunity to promote the fact that I’ve published two — count ’em, two — new reviews this week for DVD Verdict, cyberspace’s premier hotspot for film and television criticism. If you’re into romantic comedy with a message, you might enjoy my examination of Tyler Perry’s Why Did I Get Married Too? Or, if you just want to kick back and relax with a couple of insightful critiques, you might as well read both. Oh, don’t cry for me, Argentina. My problems — at least those of which I’m speaking here — are strictly of the First World variety. For most of this week, I’ve been without Internet access here at Casa de Swan. After a few pointless calls to AT&T DSL tech support, I figured out a workaround that has restored my connection. I still am without wireless hookup, so I’ve resigned myself to being chained to my office for the nonce, but at least I can communicate with the universe. I also had jury duty this week. A duty which resulted in my being selected to serve in a trial that begins next week. So if postings are sparse here for the next little while, I know you’ll understand. And… boom goes the dynamite.